This weekend we have had plenty of practice for our summer holiday next month. The hot weather meant that Lara and I could try out the new sun-cream that we got from Wilkinson and enjoy some fun in the garden. Last time we travelled abroad Lara was too young for sun-cream. Until about 6 months, western babies are unable to produce the chemicals in their skin to combat UVA and UVB sun rays so no amount of sun lotion will protect them from the harmful effects of the sun. At 3 months, our best bet was to keep Lara out of the day-time sun. 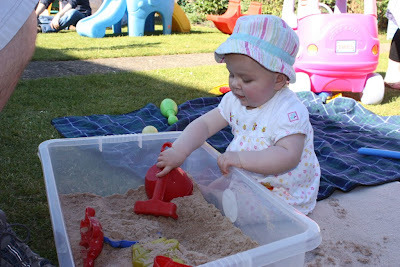 After 6 months, if you plan to let your littlies play in the sun, you have to do your very best to keep their skin safe. If you start to teach them from a very early age that their skin needs protecting in the sun, the less damage they will do to their skin over their lifetimes. When you are looking for sun cream for a toddler, go for the highest sun protection factor (SPF) you can find and make sure that their protection level has been certified. SPF 50+ is really the best option for young skin so even if you would normally choose a lower factor cream for yourself, make sure you also buy a high-protection cream for your children and make sure you top it up frequently. 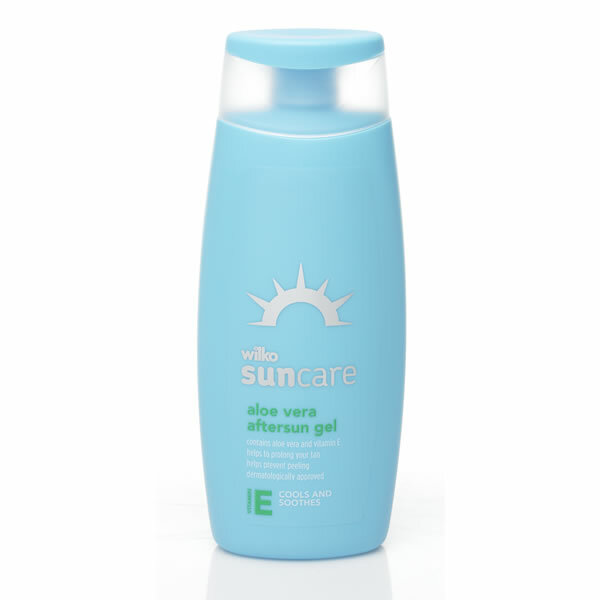 Wilkinson's new formula of sun cream is available in factors all the way from 6 up to 50 and their latest formula has been given a 5-star UVA protection rating. The sun cream is thick (a good sign when it comes to high protection from the sun) and their children's range is a groovy purple colour! Mind you, all of Lara's clothes from this weekend are now slightly purple around the edges (but it does appear to have come out in the wash!). Another great tip when choosing sun cream for your summer holiday – choose a brand where the lid stays closed during travel! All too often I have got to my destination only to find that half of the sun lotion is pooled in the bottom of my bag (the first time this happened, I learned always to wrap the bottles in a plastic carrier bag, but even so, a plastic bag full of sun cream is an expensive surprise you don't really want when unpacking your bags). Wilkinson's bottles have got clip-top lids but their range also features spray-pump bottles which are less likely to open during travel, and which can be fun to use for children and adults alike. If you are out in the sun with your little ones, make sure you give them a hat to reduce fluid loss through their heads and to prevent sunstroke. Keep them topped up with water (have a cup handy at all times) and, if you can possibly do so, avoid going out in the direct sunlight during the middle of the day when the sun is at its highest and strongest. After sun exposure it is a good idea to moisturise skin with a really light-weight moisturiser. An after-sun lotion is ideal because it is designed to be easily absorbed into the skin and to reduce the irritation of sunburn; personally I swear by the stuff to help my holiday tan develop nicely but I often use it when I get back from holiday as an everyday body lotion too. Wilkinson's range of sun creams are available in store from £2.98 for standard bottles, £3.98 for spray bottles and their after-sun costs only £1.98. I've been very impressed by the quality and I think they're great value for money.